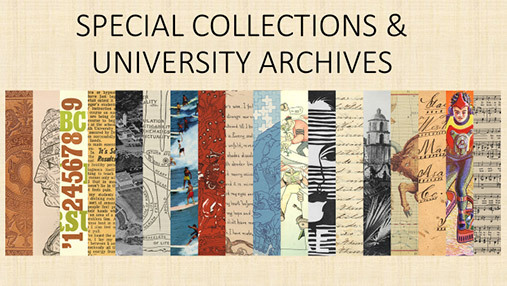 The Department of Special Collections & University Archives (SCUA) houses rare, fine, unique, and valuable books, periodicals, manuscripts, and documents which require preservation, security and care in handling. Other valuable historical items such as photographs, prints, postcards, memorabilia, scrapbooks, and oral histories are also held in Special Collections. University Archives holds materials which document the history of San Diego State since its founding as a Normal School in 1897. Use the Finding Aid Database to search archival collections. Research by title, type, subject or search by keywords. Search the SDSU library catalog.